Settling in up north, newly-Canadian superhero Malcolm Dragon spent this week's issue alternately dealing with a reality TV crew, rescuing his mischievous children, and facing off against a supervillain who could kill most normal people with the wave of his hand. And the result, as we alluded to in our review roundup, was pretty great. Larsen joined ComicBook.com to talk about the issue, which features the first appearance of a cool, strange new villain that culminates in a very strange cliffhanger...! Warning: Spoilers ahead. 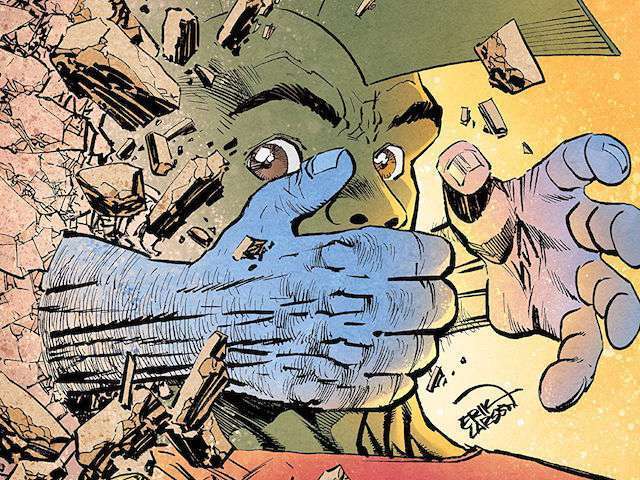 If you have not yet read Savage Dragon #232, pick up a digital copy here and read along with us. I kind of like the idea that most of what goes on in Chicago seemed end-of-the-world at the time but does not get around outside of town. Was that just establishing some ground rules or is it possible we could see Dart or someone else try to expand operations? I would think that a lot of stuff does make it out of that bubble but those kinds of things would be the more major events like Savage Dragon saving the world from Darklord and his tragic death or the Merging of Multiple Worlds—the every day stuff like Dart and the Vicious Circle happenings is not really world news. Dart escaping from jail doesn’t impact citizens in Toronto. Nor would her having a baby while incarcerated. It’s just not a big enough event. Is it safe to assume that it also opens up the probability that there are powerful people or groups that Malcolm does not yet know about because he isn’t from Toronto? Oh, absolutely. But that’s literally everywhere. Canada can and will have all kinds of things Malcolm was oblivious to as an American. And all kinds of things are going on back in Chicago that Malcolm is oblivious to. A lot of news is provincial. If there’s an airplane goes down into the Atlantic we always have to find out if there were any Americans onboard. At the same time, Canadians are going to want to know if there were any Canadians on that flight. Those two people on Centre Island were more detailed than most dialogue. Was that on purpose, since they are at a touristy spot? I just think it’s funny how some people are really into the place that they live in. I see this all the time in San Francisco where people will have posters on their walls of San Francisco related things and people love to tell tourists and others some juicy bits of San Francisco trivia. I imagine it’s like that all over. People from Toronto are proud of their home and enjoy telling people about it. Is Maxine’s dread and then reaction when Malcolm returns home playing for the cameras? I kind of assumed it was but you never showed them in the room. No, no—it’s real. I was actually tempted to have that same panel reappear later with her trying to fake those emotions and the kids just not feeling it. But—space restrictions prevented that. When the cameras are in the room I make an effort to show a cameraman in a panel to establish that. On any given page—that should be the case. Just as Kevin and Maxine’s mom aren’t hanging around just off-panel. If they’re there—we see them. Is it safe to assume that you don’t plan on “cutting back” to them forever and that soon/now, it will become a question of letting the audience decide when people are and are not being authentic? No, no—I want to play fair with the audience. The crew is there when we see the crew. I don’t want readers to be confused at any point. My job is not to confuse them—it’s to make things clear. We have seen that most of the Dimension-X aliens are at least semi-sentient. Is Team Michael Dragon eating a “person” here? No more than eating a cow is "eating a ‘person’" or eating a pig is "eating a ‘person’". And certainly there are people who get indignant about that. Humans eat animals all the time. This is no different from that, really. Many of the creatures here aren’t all that bright. They’re certainly no more intelligent than a cow or pig. Where does the name Michael come from? Often names are just names that one or the other parent liked. He wasn’t named after any specific person although I was thinking Michael Jordan when I dubbed him that. Actually, if he has a hyphenated combination of mom and dad’s last name he’d be Michael Jackson-Dragon, which would be a little weird. Michael kind of rolls with the idea that Dragon is dead in this reality. At this point do you think he’s kind of unfazed by much? It’s a dad he never knew in a world far removed from Earth. I would expect that he’s seen a lot of death over the years. But keep in mind, the pregnant women Darklord had stored away were all taken from their respective Earths as they were destroyed—so Rapture might very well have told Michael that his father is dead because that’s the reality she knows. On the one hand, The Wraith seems like a really cool character with a lot of potential. On the other, this is a really interesting predicament you created by killing him in his first appearance. Did you know when you came up with the idea what the “punchline” was? I didn’t. A lot of things are done on the fly. I think big picture when I’m writing books—and that means that I know overall where I’m going. Characters have their own individual dreams and aspirations—they’re each working toward something. And much of the rest is me knowing obstacles in their way. When I drew the cover, months ago, all I had figured out was that he could walk through walls and that he had blue skin. I actually drew a splash of a character who might have been him but I decided it wasn’t a good fit. I know fans have a preconceived notion that writers should have their whole stories all figured out but that leads to predicable stories where writers are just ticking off the boxes on their checklist. People ask me, “Did you know where you were going when you started this book?” And the answer is no—not really. Only in the broadest sense. What kind of madman sits down and figures out 232-plus issues before they get started on a book that may not make it to double-digits, much less triple-digits? Not this madman, that’s for sure. The punchline came about from me searching for a decent cliffhanger and then coming up with a cool visual. By the time I was into the story I knew where I was going with that. Umm…is Maxine dead? I am guessing this means the new baby has lightning powers. I remain unconvinced that spoiling every cliffhanger prior to the next issue is a good way to go. She is on the next cover of #233—but that was a promo shot taken for the TV show and it may not reflect the contents of the actual book. So--stay tuned!